The Wall Street Journal reports that Pewdiepie had editorial independence in his deal, but this was a bridge too far. “Although Felix has created a following by being provocative and irreverent, he clearly went too far in this case and the resulting videos are inappropriate,” said a spokeswoman for Maker Studios. Disney bought Maker in 2014 for $675 million. After Pewdiepie threatened to leave in 2016, Maker hung onto him by partnering with him so he could create his own entertainment network called Revelmode. The idea was to give Pewdiepie and his friends a platform to create videos, games, apps, and merchandise. 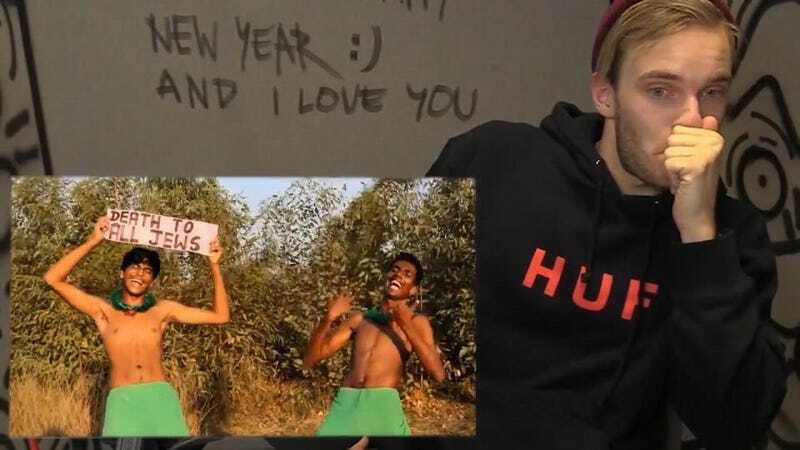 In the “Death To All Jews” video, Pewdiepie, who hired the men via freelancer site Fiverr, reportedly said, “I didn’t think they would actually do it.” The Indian men later apologized in a video, saying, “we really don’t know what the message meant when making the video.” All three were banned from Fiverr. Pewdiepie, however, pleaded for the service to un-ban the two men. Pewdiepie is a hugely prominent public figure no matter how you slice it, and his recent gaffes have prompted reactions from all corners of the Internet. People on YouTube came to his defense, believing he was simply telling un-PC “jokes.” However, he also received support from places like neo-Nazi website Daily Stormer, which reportedly changed its name to “The world’s #1 PewDiePie fansite” late last month. Jonathan Vick, an associate director of the Anti-Defamation League who spoke to WSJ, however, summed up the real world consequences of Pewdiepie’s actions nicely. “Just putting it out there brings it more and more into the mainstream,” he said. It’s an especially poor choice on Pewdiepie’s part in a time when, remarkably, people are having very real discussions on how to deal with a resurgence in real-world nazism. Now Pewdiepie will have to face some consequences of his own. Correction: an earlier version of this story stated that Pewdiepie’s plea for Fiverr to unban the two men featured in his video had been ineffective. It appears that they were actually unbanned after all.